Alyssa: There are a bunch of islands between Norway, Iceland, Denmark, and France. The ones that aren’t part of Norway, Iceland, Denmark, or France are usually called “the British Isles.” This term is fairly loaded, as it was apparently invented to justify English dominion over Ireland, but no substitute other than “Great Britain, Ireland, etc.” has been forthcoming. Alyssa: The two largest islands in this group are Great Britain and Ireland, but there are about 6000 islands there. Some notable islands and groups within the “British Isles” are the Inner and Outer Hebrides, the Isle of Man, the Isle of Wight, the Shetland Islands, the Orkney Islands, and the Channel Islands. Some people leave out the Channel Islands, but that’s even more pointlessly confusing than the rest of this story. IC: That’s a lot of islands. Is it a lot of countries? Alyssa: Not really. Politically, the British Isles are at the moment divided between two sovereign states: Ireland, and the United Kingdom of Great Britain and Northern Ireland. Alyssa: Until 1927, the UK was the United Kingdom of Great Britain and Ireland, and claimed all of Ireland. But now, most of the island of Ireland is an independent country. Sometimes, the country of Ireland is referred to as the “Republic of Ireland,” to distinguish it from its non-independent counterpart Northern Ireland and from the island of Ireland as a whole. IC: Ah, okay. So where does Scotland fit into all of that? Alyssa: The current United Kingdom consists of four subunits referred to as “constituent countries”: England, Scotland, Wales, and Northern Ireland. Because the UK is not a federal state, these units have varying degrees of autonomy from the UK’s parliament in London, and each area of control is the subject of much wrangling between the overall UK government and each constituent country’s government. Within England, there is also Cornwall, a small region that is pressing for more autonomy of its own and, conceivably, status as a fifth constituent country. The constituent countries that aren’t England are characterized by retaining Celtic heritage that is not particularly evident in England, including Celtic languages such as Cornish and Welsh. The four countries share the same monarchy, so the Queen of England is also the Queen of Scotland, the Queen of Wales, the Queen of Northern Ireland, and a few other places, but we’ll get to that. IC: Wait, England isn’t the same as the United Kingdom? Alyssa: Great Caesar’s goats, no. England had close to 75% of the United Kingdom’s population and dominates the UK’s political environment, but it is only one of the four constituent countries. This is important to recognize, because referring to things associated with the United Kingdom in general (rather than England in particular) as “English” effectively erases Scots, Irish, Welsh, Cornish, Shetlanders, and other indigenous minorities in the UK as distinct cultures and identities. “British” is the only adjective and/or demonym that seems to exist for the people and things of the United Kingdom as a whole, but as with “British Isles” this is potentially a loaded term. It’s better to use the more specific terms if you know them. IC: That makes sense. So where do those other islands fit in? Alyssa: Most of the “British Isles” are officially part of either Ireland or one of the United Kingdom’s constituent countries. Shetland, Orkney, and the Inner and Outer Hebrides are part of Scotland, the Isle of Wight is part of England, the island of Anglesey is part of Wales, and so on. A few of the islands have a special status, though, as something called “crown dependencies.” These island groups are not part of the United Kingdom officially, but are mostly-independent states that owe allegiance to the British monarchy based on centuries-old treaties. Special councils act as go-betweens for the dependencies and the Queen of England, and the United Kingdom is responsible for their international relations, defense, and similar concerns. In extreme cases, the UK’s Parliament is authorized to legislate over the dependencies, but this is very rare. Citizens of a dependency are also citizens of the United Kingdom. The crown dependencies are some places you might have heard of: Jersey, Guernsey, and the Isle of Man. Alyssa: The United Kingdom also has overseas territories. These areas are at great geographic remove from the “British Isles,” and are the remnants of the UK’s colonial empire. Like the crown dependencies, these are mostly autonomous and not officially part of the United Kingdom. The biggest difference between the two categories is that territory inhabitants are usually considered British Overseas Citizens rather than full citizens of the United Kingdom. This separate legal category means that they don’t have an automatic right to relocate to the United Kingdom proper. Other differences are best left to British legal scholars. 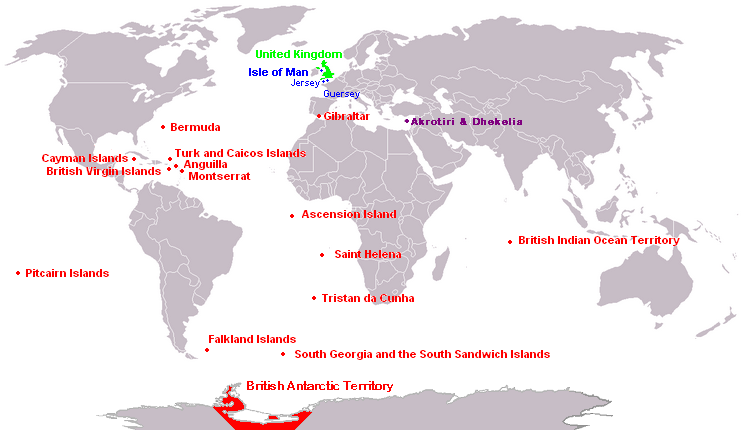 The British overseas territories are Akrotiri and Dhekelia, Anguilla, Bermuda, the British Antarctic Territory, the British Indian Ocean Territory, the British Virgin Islands, the Cayman Islands, the Falkland Islands, Gibraltar, Montserrat, the Pitcairn Islands, Saint Helena, Ascension and Tristan da Cunha, South Georgia and the South Sandwich Islands, and the Turks and Caicos Islands. There used to be many more, but much of the former British Empire has gained independence or fused with neighboring sovereign states. More mergers are probable in the future. IC: That all seems kind of pointless. Alyssa: It is. A lot of stuff like this is weird colonial legacies that take a long time and a lot of political will to dismantle, so it’s a slow process. Some of it is intentional, though. Crown dependencies and British overseas territories are outside of the European Union, so they’re useful as tax shelters and ways to take advantage of being tied to but outside of large European institutions. A lot of the smaller subordinate regions also appreciate being able to rely on the military and economic power of the United Kingdom, as they do not have the population or resources to sustain similar institutions on their own, but don’t want to merge fully with the United Kingdom because of what that would mean for their small native populations and culture. IC: So what’s this I hear about Canada still having a queen? Alyssa: Some former UK colonies have gained full legal independence and act as independent states in international affairs, but have retained the British monarch as their official head of state. These 16 countries are known as “Commonwealth Realms.” This doesn’t mean much in practice, as the British monarch is a nearly powerless symbolic figurehead and has not wielded her potential executive power in a long time. Still, most of these countries also host movements to get rid of the monarchy as an expensive and somewhat pointless institution and hypothetical threat to their independence. The Commonwealth Realms are Antigua and Barbuda, Australia, the Bahamas, Barbados, Belize, Canada, Grenada, Jamaica, New Zealand, Papua New Guinea, Saint Kitts and Nevis, Saint Lucia, Saint Vincent and the Grenadines, Solomon Islands, Tuvalu, and, technically, the United Kingdom itself. Here’s where we are now, to show what a tangled mess this all is. Alyssa: The term “commonwealth” is, in part, a reference to the Commonwealth of Nations, an international body comprising most of the former colonies of the United Kingdom. This body enables these colonies to maintain an unusually warm and integrated diplomatic relationship, even the ones that have rejected the Queen of England as a formal head of state. This body includes the 16 Commonwealth Realms and also dozens of other independent states with a British colonial past. Officially, membership in the Commonwealth is contingent on maintaining certain standards of human rights, but that standard is much laxer than one would expect and not particularly well enforced. One effect of the Commonwealth is maintaining the Commonwealth Games athletic event; another is that diplomatic relations between Commonwealth countries is handled via “High Commissions” rather than embassies, because the countries are supposed to not be foreign to one another. IC: I’m confused again. Can you summarize all of that? Alyssa: The British Isles are a geographic region. That region has two sovereign states in it: Ireland and the UK. The UK has four constituent countries in it: England, Scotland, Wales, and Northern Ireland. The UK also has some control over two classes of semi-autonomous territories: crown dependencies and British overseas territories. The UK shares its monarchy with those territories and also with 15 other independent countries, called Commonwealth Realms. Those realms and a bunch of other countries maintain closer relations than most via the Commonwealth of Nations, an organization based in international treaties. IC: So…what’s all of that mean for Scotland last week? Alyssa: Scotland’s vote was about whether to remain one of the United Kingdom’s constituent countries, or to become its own, independent state like (the Republic of) Ireland did close to a century ago. Last I heard, they planned on retaining the monarchy, so that would make an independent Scotland a Commonwealth Realm like Canada, as well. But that didn’t happen, so Scotland is still part of the UK. IC: Will you be talking more about that soon, since this is exactly the kind of thing your Shifty Lines series is about? Alyssa: You bet your imaginary correspondence, I am.